When the hunters become the hunted, ex-CIA agent Jed Walker is the man you need. In 2011, Seal Team Six killed Osama Bin Laden. Now, four years later, someone is eliminating Team Six – one by one they are turning up dead. Jed Walker, ex-CIA, is an outsider back in the game. He’s been chasing down a sinister group code-named Zodiac that the big guns – MI5, CIA, the Pentagon – have failed to eradicate. But as Walker follows the trail of bodies, uncovering secrets and making connections he’s not supposed to make, he finds the answers are closer to home than he ever imagined. Revenge is the obvious motive, but nothing is ever that simple in love or in war. Can Walker find who’s responsible before the body count grows higher? Can he stop another terror attack before more innocent bystanders suffer? When the line between the good and the bad become blurred, when the hunters become the hunted, only one man can save us all. 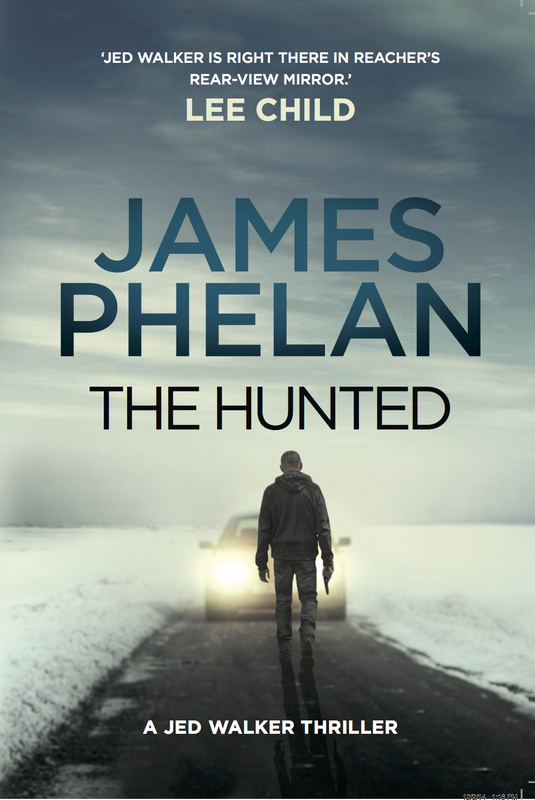 The Hunted is the second Jed Walker novel – a white-knuckled rollercoaster of action suspense. Walker sat at the bar, ordered a beer, and waited. though they had only ever served American beer, cold. Most of the men were drinking whisky, or a clear liquor that looked like some kind of local brew not far beyond bathtub moonshine. The prohibition hadn’t much touched these parts, but they’d made their own supply regardless, before and after; that’s what these people were good at: they got by, on their own, no outside help needed or wanted. He had spent almost a week asking around, while McCorkell and his team were working from desks, checking phone records and databases. All of them looking for a SEAL who didn’t want to be found – the one unaccounted-for member from the Abbottabad raid that had killed bin Laden. Which was why Walker elected to be here, on the ground, searching for this SEAL. Needle in a haystack? He had fifty bucks against Somerville and Hutchinson that he’d beat them to finding the guy. Thing was, how do you find a highly trained operator who doesn’t want to be found? When the hunter becomes the hunted, the hunter turns pro. And this was the SEAL’s backyard – if he didn’t want to be found, he was going to stay that way. And that reality was starting to wear away at Walker. The bar was in a squat building sitting in the middle of a paved car park on the highway that cut through town. It was confederate grey on the outside, union blue on the inside. The patrons were old and young, nothing in-between. Thirty-four people. The women drank beer. None sat alone; each with a man. Of the twenty-two men, six looked like they would be more than capable in a bar fight – though, Walker thought, who knew what a capable man looked like in these parts? Hatred ran deep here, wariness was a second language, and near-on everyone was armed. It felt like a closed community because it was, as closed as a place could be without barbed-wire-topped walls. Those compounds in the Middle East that protected Westerners and local big shots had nothing on these people. The folk here were kin. They didn’t need walls to keep unwanted people out; didn’t need locks on their doors, nor their cars. The fact was, Walker knew, if you messed with someone here, they, and their family – considerable in size and spread wide in geography – would see to it that before you managed to reach a county or state line, you’d never trouble anyone again. Another thing he noticed was that the outside world could end and little here would change. Self-sufficient didn’t begin to describe these folk. Walker settled in, watching and listening. The hubbub was inconsequential but he listened hard. Every time he sipped, he watched the scene around him in the mirror behind the bar. When he wasn’t looking up, he was looking at his beer bottle, eyes down, like they did in these parts. The same went for interference, Walker knew. Meddling. Messing. The town welcome signs might as well have read ‘Ya’ll not welcome. Turn around’. The empty streets outside were louder than this bar. No music played, the conversations were hushed, the occasional laugh or snort was brief and muffled, the loudest noise being the bang of the bathroom door – flimsy plywood into a battered and warped timber frame. Walker finished his drink and glanced up and down the bar, a side- to-side sweep. The mirror above the bar had a patina of rust eating at it from the aeons of damp that clung in the valleys here until noon. Everyone wore denim of some sort, and a mix of T-shirts and cotton checked flannels, leather jackets and parkas. Heavier coats hung on the wall near the door. Not even winter and the cold was cutting and dank. ‘Another beer,’ Walker said, sliding his empty bottle forward. The guy behind the bar popped another, handed it over and took the money from Walker’s previous change of a twenty. All in silence. He returned to the end of the bar, to Walker’s left, where he spoke with three young men. There were two empty bar stools and then a couple of old guys between Walker and the three boys. The latter were young, early twenties, but Walker counted them among the six capable guys in the room, along with another wiry young guy sitting with a girl at a table directly behind him, and a couple of older men sitting about fifteen feet away by a stack of firewood. Immediately to Walker’s right at the bar was a couple in their late fifties. They were why he’d chosen this spot to sit, after standing at the bar and ordering a beer from a bartender who Walker had quickly realised would not be forthcoming with information. The couple next to him had just finished their dinner; roast beef, boiled vegetables, gravy, biscuit. The woman, on the stool beside Walker’s, was drinking a glass of light red wine. Her husband was a local; her clothes and make-up and jewellery told Walker she was either a transplant or was trying her best to look like one. Maybe that meant she’d be friendlier, more forthcoming. ‘Excuse me,’ Walker said to her, his tone that of one outsider to another. Nothing. Her back was half-turned to him, her bar stool pointed thirty degrees towards her husband. Walker leaned back a little, watching the husband drain the last of the clear stuff from a lowball, and forced his way into the older man’s eye-line. The husband almost nodded. He looked over Walker’s shoulder, then back to the bar in front, not making eye contact again. The man didn’t look at Walker, but he shook his head. Walker sold the lie convincingly, but the husband wasn’t buying into the conversation. His mouth was shut tight. The wife, however, had turned front on, and she was now eyeing Walker in the faded and rusted old mirror above the liquor bottles. Neither of them said anything, but Walker could tell that Charles Murphy was a name they’d heard. So, they either knew him or knew of him. Sure, there’d be a lot of Murphys around here, but this one they knew of. ‘Maybe he doesn’t live around here,’ the wife said. Her accent was local. Her lips pursed when she finished speaking. Her lipstick was an orange shade of red. She was older than Walker first thought, or maybe it was just this climate, sucking the life out of her bones, forcing her face into a squint of cracks and creases. Walker noted the tone. It wasn’t a suggestion to leave. And yet, it was an invitation. He was getting nowhere talking like this. But the fact that she was closing the door to this town on him? Well, that suggested he’d found the right place. It was in her eyes – she knew Murphy. And she was smart enough to know that Walker knew that she knew. The woman looked all the world like she was up for a challenge by some stranger pressing her for answers, and knew that she had all the advantages and then some. ‘Air Force,’ Walker replied, telling the truth. She seemed a little disappointed. Her eye twitched. She was someone not used to being corrected, let alone outright challenged. Her eyes were as grey as the outside of the bar. Her face was angular and much harder than the blurred and patinaed mirror had suggested. She had a high hairline and pale wrinkled skin. There was a line around her face where the make-up stopped, paler than pale. The woman held Walker’s eye for another two seconds, then looked over his shoulder and gave the slightest nod. She then lifted her glass for a moment, placed it back down. By the time the barkeep had refilled it from a bottle with a cork, Walker sensed movement behind him. Walker turned around on his seat, watching the mirror as he did so. The three guys from the end of the bar. They moved before he could adequately react. He could have enacted several options, most of them lethal, but he let them win the first round while he evaluated and reassessed based on their actions. Two of the guys grabbed Walker by the arms, pinning him where he sat, his back now to the bar. The third man stood before him, arms hanging by his side, fists clenched. Walker smelled alcohol coming from the three of them. More pros than cons, that fact. They’d have slower reaction times. Be less precise in their movements. Bleed more. The guys who pinned Walker had grips that made forged bench vices seem like paperclips. Someone in the bar sniggered. Someone else shushed that person quick smart.